The Mike Gillis regime that took so much heat in Vancouver may have pulled off a remarkably effective trade just before the 2013 NHL Entry Draft. Although Cory Schneider has proven himself as one of the best goalies in the league during his time with a struggling New Jersey Devils organization, the bigger surprise is the immense impact that 20-year-old Bo Horvat has had on the Vancouver Canucks. 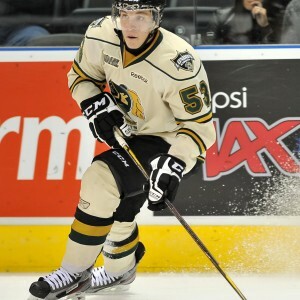 The year after Horvat was drafted, he posted 74 points in 54 games in the Ontario Hockey League. Just a few months after finishing his final season in the junior ranks on strong note, Horvat shocked the Canucks’ coaching staff with his professionalism, strength and skill. Contrary to what was expected, Horvat earned himself a roster spot with the big club and never looked back. In 68 games with the Canucks last season, Horvat recorded 25 points on 13 goals and 12 assists. Not bad for a first timer. Towards the end of the season and into the first round of the playoffs, Horvat proved to be one of the Canucks’ most reliable options at center. After such a solid finish to a surprise season, it only felt natural that Horvat would unseat the under-performing Nick Bonino for the second-line center position; in fact, it was almost guaranteed that he would start the season centering that second line … until the Canucks moved Bonino and change to the Pittsburgh Penguins for general manager Jim Benning’s highly endorsed Brandon Sutter. The team subsequently signed Sutter to a five-year extension worth $4.375 million per year beginning in 2016-17. When the ink hit the paper on that deal, Horvat’s certainty of being a second-line center vanished. What Sutter brings the Canucks in an assumed second-line role is experience. He is a veteran of just under 500 NHL games at just 26-years old and, after a successful beginning in Carolina, struggled to find his game in Pittsburgh. That is where Vancouver comes in. The team was obviously underwhelmed with Bonino’s lack of consistency last year after starting strong and finishing woefully, so they decided that a change of scenery would be his best bet. The gamble they are taking on Sutter? Giving him his first shot at a viable second-line role. His competition? The young Horvat. What Sutter doesn’t have that Horvat does is … well … everything but experience. Horvat started slow and nervous last year, as any youngster in the league does, even the phenoms. Horvat finished his rookie year dropping jaws by displaying his explosive speed, seamless positioning and knack for the net. He began to echo Ryan Kesler in his Canucks heyday. Even if Sutter starts the season as the second-line center between the predicted wing set of Radim Vrbata and Sven Baertschi, there are no negatives to that situation. At all. It gives him a chance to prove himself as a second-line center with second-line talent. He will be given every opportunity to perform in that role and will either quiet the haters or permanently define his role as a solid third-line middleman. With the 27-year old eating up the second-line minutes though, Horvat will surely be the third-line center and should be flanked by the highly skilled duo of Chris Higgins and Jannik Hansen. The sheer speed of the that line has it looking like a second-line option B. As Horvat gets more comfortable taking on a bigger role from the fourth-line play he spent most of last year enjoying, he will be waiting for Sutter to drop off. And if Sutter does, be ready to see Horvat explode on the scene. Horvat’s patience and perseverance will be tested to the max this October. Even though players themselves steer clear of speculation, I am sure that he considered himself a strong option for the second-line spot after his playoff performance. Now with Sutter in the mix and with such a strong managerial validation of him, it’s up to Horvat to earn his spot in the top-six.